“When you’re worried and you can’t sleep just count your blessings instead of sheep. And you’ll fall asleep counting your blessings.” In case you don’t know where that came from it is a song featured in the movie White Christmas. Many also associate sheep with people. For example, I’ve heard people say that “she is a wolf in sheep’s clothing,” meaning that sheep have the appearance of being unthreatening and docile. Those in the Christian faith equate sheep (a lamb) with Jesus. He was the sacrificial lamb to save everyone on earth from Hell. So, it seems that the sheep and its meaning may be very entrenched in our society and our cultures. If you have a sheep, or even a lamb, pop into your world, what should you know? What should you do about it? Remember that the male sheep is a ram. We’ve already discussed the ram, so it stands to reason we should discuss the female counterpart. When the sheep comes into your world the creature offers a way for you to retrieve your innocence. Although many of us don’t want to admit or accept it, we are vulnerable. That makes us feel weak, but the sheep reminds us that the two emotions are completely misunderstood. The sheep tells you that there is still a small, innocent child inside of you who needs nurturing. On the far end of the spectrum, the sheep could also mean that you often conform to societal rules and norms. The primary symbols of the sheep include sacrifice and nurturing. They are also synonymous with gentleness. On a deep spiritual level they represent fertility, spiritual connectedness, magic, power, and sun energy. In nature, the sheep divide into two groups on their own. They consist of nursery herds and bachelor herds. According to All Totems, the nursery herd is made up of ewes and lambs. The group members cooperate to find places to graze while providing protection to one another. The bachelor herd, on the other hand, is a group of mature males who are constantly reorganizing the pecking order (All Totems). They consistently challenge each other’s strengths in contests. The winner gets to mate with the females. Both males and females have distinctive bleats and voices. The females are the best at figuring out the voices of the baby lambs. A sheep person is usually a very good listener. They will likely be in the field of counseling or therapy. They are also wonderful friends because they are so good at listening. They are supportive people who are usually active in their community. They take care of people. They are loyal, and even when things get rough, they can be counted upon. They don’t have a problem stepping outside of the box to offer care to other people. They are experts at it. Back to the tough subject: vulnerability. The sheep is there to help you recognize those feelings of vulnerability. The sheep helps you see that you are overwhelmed with those feelings, and in turn you feel powerless. By looking inward at the innocence you still have, the vulnerability can be turned into a positive. 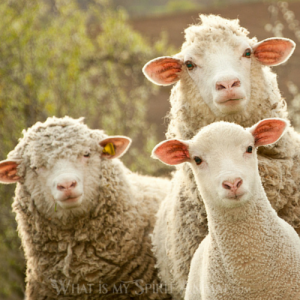 By relying on your sheep, you can revert back to the child inside of you making everything new and wondrous. When you can look at things with fresh eyes, you may be able to use positivity to your advantage. It is very possible that a lamb (a baby sheep) may appear to you at first. As time passes, you may see the lamb grow into a ewe or a ram. Keep an eye on that because there is a difference between the female and male spirit of the sheep. As you charge into the new year, perhaps the appearance of a sheep will help you decide that vulnerability doesn’t mean you’re weak. In fact you should feel empowered. Children often feel like they can overcome all odds. That’s the spirit the sheep lends to you! That’s the spirit you need in order to make changes. New challenges come with every new year; every new day! With the sheep as your ally, you can open doors that have been locked, and you can learn more about yourself than you ever thought possible! Dolan, R.E. (Producer), & Curtiz, M. (Director). (1954). White Christmas [Motion picture]. United States: Paramount Pictures.